Timeshard, a Liverpool based 3 piece, formed in 1988 at the start of the 'acid-house revolution' but their influences were really much more firmly rooted in the electronic music and space rock traditions of the 1970's. 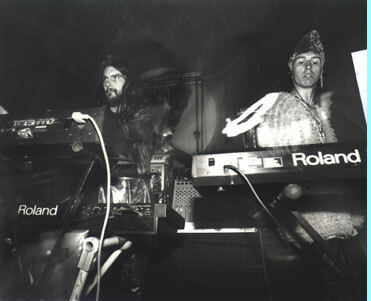 Fronting a wide array of ancient but totally irreplaceable analogue synths, Gobber, Simon and Steve set out to produce a unique live experience, honed at countless free festivals across the UK. Truly psychedelic sets, delivered totally live by the 3 band members standing in front of a tardis-like array of synths and cables came to be their hallmark and they followed these up with 2 excellent cassette albums Who Pilots The Flying Saucers and Hyperborean Dome Temples of Apollo which is how they came to end up being one of the posse of bands that regularly played at Club Dog in London. The band signed to Planet Dog Records in 1994 (signing their contract on Parliament Hill - one of the most important ancient meeting places in London) having recorded a studio album for a label in Liverpool that was then unwilling to release it. Planet Dog took on the project which was released later that year as the incredibly spacey Crystal Oscillations. 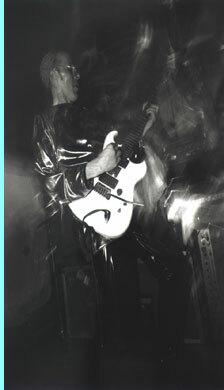 The release was followed by plenty of gigging and a more techno-influenced EP Zero (Ouroboros) in 1995. 1996 saw the band revert to the studio to record tracks for their next album Hunab Ku, a wild and very diverse collection of tunes covering all kinds of styles, but with a definite 'Shardian psychedelic twist. Click here to see Timeshard's discography.